There are NO safe levels of radiation. Sure. Iwate Prefecture is Japan alright. 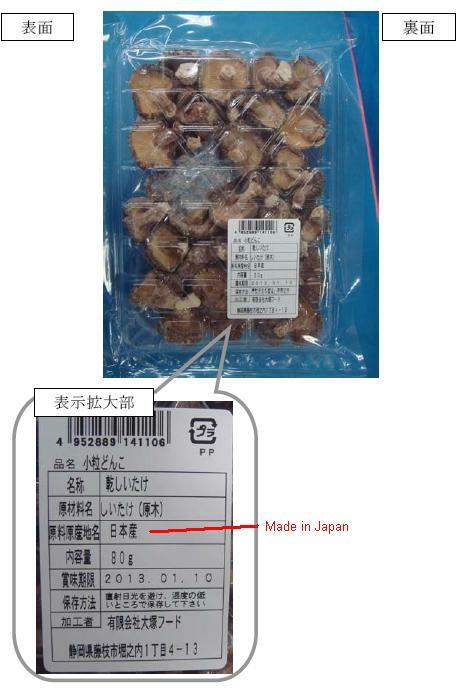 Since the company who packaged the dried shiitake claims it has mixed shiitake harvested in different parts of Japan (never mind that they did say the shiitake are mostly from Iwate Prefecture), the label can claim “made in Japan”. Yokohama City announced on February 9 that 2,077 becquerels/kg of radioactive cesium was detected from dried mushrooms sold at a supermarket in Kohoku-ku in the city. The provisional safety limit is 500 becquerels/kg. 7 packets have already been sold. The city notified Shizuoka Prefecture where the packaging company is located, and ordered the supermarket to recall the packets. After being notified by a citizen who measured the radioactivity [of this dried shiitake] on his own, the city conducted its testing on February 9. The Tsunashima-Tarumachi store of a supermarket chain “Big Yosun” sold these mushrooms with effective date of 1/10/2013. Otsuka Food located in Fujieda City in Shizuoka Prefecture packaged the mushrooms in 80 gram packets, which was sold exclusively at the supermarket chain. According to the packaging company, the mushrooms are mostly from Iwate Prefecture. According to the supermarket chain, their Tsunashima-Tarumachi store had purchased 20 packets, and sold 7 packets. 2 other stores also had the packets but none of them have been sold, according to the chain. According to the city, if one eats 80 grams of this dried shiitake the internal radiation for 0-year-old would be 0.003833 millisievert, and 0.0025724 millisievert for people 13 years old and older. It is considered that if you re-hydrate the shiitake, the density of radioactive cesium would drop to about one-tenth. According to the new safety standard guidelines that the Ministry of Health and Labour has compiled to take effect in the new fiscal year [starting on April Fool’s Day], the internal radiation exposure limit is 1 millisievert per year or less. As if 80 grams of dried shiitake from Iwate with radioactive cesium is all you eat the whole year. – Japanese Government To Raise Food Radiation Safety Limit For INFANTS From 50 Bq/Kg To 100 Bq/Kg! – ALERT: Radiation Cloud Detected Over New Zealand (Jan. 29, 2012): Almost 2 MicroSieverts/Hour In The Wind!!! – NY High-End Restaurant Chefs Learn At Japanese Cuisine Workshop How To Prepare … Of All Things … SUSHI, Woorkshop Organizer Chef Daniel Boulud ‘Believes’ Japanese Ingredients Are Safe! – Worst Case Scenario: Where To Go When Reactor No. 4 SFP Falls On The Ground? – Fukushima Government Promotes ‘Safe’ Fukushima Milk For School Lunches! – Radiation Levels Double After Decontamination Effort In Fukushima Pref. – And Now: Japanese Government To Measure Radiation Of Rain And Snow In Fukushima Prefecture … The Results Will Be Released In March! Three thousand billion (3,000,000,000,000) Lethal Doses of Radiation means there are 429 Lethal Doses chasing each and every one of us on the planet, to put it in a nutshell.